His second and third albums, 2003's The Dreamer and 2004's Blake Shelton's Barn & Grill, are gold and platinum, respectively. His fourth album, Pure BS (2007), was re-issued in 2008 with a cover of Michael Bublé's pop hit "Home" as one of the bonus tracks. His fifth album, Startin' Fires was released in November 2008. It was followed by the extended plays Hillbilly Bone and All About Tonight in 2010, and the albums Red River Blue in 2011, Based on a True Story... in 2013, Bringing Back the Sunshine in 2014, and If I'm Honest in 2016. As of June 2017[update], Shelton has charted 33 singles, including 24 number ones, 17 of which were consecutive. The 11th No. 1 ("Doin' What She Likes") broke "the record for the most consecutive No. 1 singles in the Country Airplay chart's 24-year history". He is a seven-time Grammy Award nominee. As one of the most successful country artists today, Shelton has sold over 10 million records worldwide, and as of 2017[update], has sold in excess of 30 million singles, while having generated a total of 1.7 billion streams worldwide. Shelton has also amassed a tremendous commercial impact on the country music industry. His debut single "Austin", off his 2001 Platinum-selling self-titled album, tied the record set by Billy Ray Cyrus in 1992, staying atop the country charts for five weeks, and setting the mark for an artist's debut single in the Broadcast Data Systems era. The success of "Austin" also led Shelton to claim the No. 1 position on both Billboard's Hot Country Singles & Tracks chart and Top Country Singles Sales chart, making him the first debut male country artist to own the top spot on both charts simultaneously. 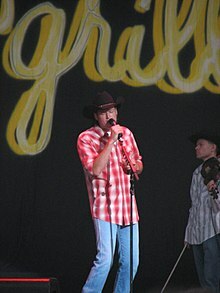 Later, in 2010, Shelton's first single, "Honey Bee", from his sixth studio album Red River Blue, set a new record for the most first-week downloads by a male country singer. As a result of the downloads, the song debuted at number thirteen on the Billboard Hot 100 chart dated for the week ending April 23, 2011. This entry made Shelton the highest-debuting male country artist on the Hot 100 since Garth Brooks (recording as Chris Gaines) debuted at number five in September 1999. As a result of the song's massive commercial success, Shelton also claimed the record for the fastest rising single ever to sell over 500,000 digital copies by a male country soloist. In 2013, Shelton's eighth album, Based on a True Story..., spawned the hit "Doin' What She Likes", which broke the record previously set by Brad Paisley in 2009 for the most consecutive No. 1 singles in the Country Airplay chart's 24-year history, since it was first tracked by Nielsen Broadcast Data Systems in January 1990. In 2016, "Came Here to Forget", the lead-off single from Shelton's tenth studio album If I'm Honest, extended this streak into a record-breaking 17 consecutive number one singles, leading him to surpass Earl Thomas Conley's record of 16 consecutive number one singles. As of 2017[update], Shelton remains one of only five country artists to have achieved No. 1 status on the Billboard Artist 100 chart, having charted all 156 weeks the chart has existed. 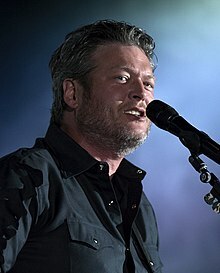 The CMA Awards also recognizes Shelton, in addition to George Strait and Vince Gill, as the record holders for the most Male Vocalist of the Year wins, as all three have each garnered 5 victories. On January 18, 2017, Shelton made People's Choice Awards history by becoming the first country artist to ever win the all-genre category of Favorite Album over competitors Beyoncé, Drake, Rihanna and Ariana Grande. During the ceremony, Shelton also took home the trophy for Favorite Male Country Artist, marking his second consecutive win in the category. On November 6, 2017, Shelton made Country Aircheck history when he became the first artist in the history of the chart to chart six songs simultaneously, from his eleventh studio album Texoma Shore. In July 2015, Shelton and Lambert announced their divorce. The couple released a statement, "This is not the future we envisioned and it is with heavy heart that we move forward separately. We are real people, with real lives, with real family, friends and colleagues. Therefore, we kindly ask for privacy and compassion concerning this very personal matter." Their divorce was finalized later that same day. In September 2015, it was announced that Shelton had started dating his colleague from The Voice, Gwen Stefani. ^ a b c d e f g h i Cohoon, Rick. "Blake Shelton biography". AllMusic. Retrieved December 29, 2007. ^ "Now 'Hear' This: Blake Shelton Scores 24th Airplay No. 1". Retrieved July 5, 2017. ^ "Blake Shelton". Recording Academy. Retrieved November 1, 2018. ^ Crossan, Jeff. "Bobby Braddock article". Songwriter Universe. Retrieved October 3, 2008. ^ "Blake Shelton: Celebrating Country Life". Ada Evening News. April 25, 2009. Archived from the original on April 29, 2009. Retrieved April 28, 2009. ^ "Gold & Platinum". RIAA. Retrieved March 14, 2017. ^ Dinoia, Maria Konicki. "Blake Shelton review". AllMusic. Retrieved September 3, 2012. ^ Homewood, Scott. "Blake Shelton review". Country Standard Time. Retrieved September 3, 2012. ^ "Blake Shelton calls number one "Home"". Country Standard Time. July 7, 2008. Retrieved July 9, 2008. ^ Vercher, Brody (October 3, 2008). "New Blake Shelton Album Bumped to Nov. 18; Features Miranda". Engine 145. Archived from the original on October 7, 2014. Retrieved October 3, 2008. ^ "Blake Shelton readies fifth CD". Country Standard Time. October 3, 2008. Archived from the original on June 10, 2013. Retrieved December 14, 2008. ^ Grand Ole Opry Celebrates Triumphant Reopening With Blowout Concert, Surprise – Our Country. Yahoo!! Music.com (September 29, 2010). Retrieved June 20, 2011. ^ Trust, Gary (May 25, 2011). "Blake Shelton's "Honey Bee" Goes Digital Gold And Makes Chart History". Billboard. Retrieved May 25, 2011. ^ Keith Caulfield (July 14, 2011). "Blake Shelton on Course For First No. 1 Album". Billboard. Retrieved July 14, 2011. ^ NBC, Coaches Bio. Archived February 15, 2012, at the Wayback Machine. Retrieved February 22, 2012. ^ Pole, Tad. "Blake Shelton Releases 1st New Song of 2013 – It'd Sure Be Cool If You Did". Big Frog 104. Retrieved January 3, 2013. ^ "iTunes – Music – Sure Be Cool If You Did – Single by Blake Shelton". iTunes Store. Archived from the original on January 11, 2013. Retrieved January 8, 2013. ^ "Blake Shelton: Video Premiere, Album Cover, Release Date, Tracklist, Demo Sneak Peek (AUDIO)! | The Voice". mjsbigblog. Retrieved March 28, 2013. ^ Jessen, Wade (March 31, 2014). "Blake Shelton makes history as 'She' becomes 11th straight No. 1" (PDF). Billboard Country Update. p. 6. Retrieved April 1, 2014. ^ "Blake Shelton Announces New Album 'Bringing Back the Sunshine'". Billboard. August 3, 2014. Archived from the original on October 7, 2014. Retrieved October 7, 2014. ^ *Please enter your name. "Blake Shelton Inducted into Oklahoma Hall of Fame". Theboot.com. Retrieved March 14, 2017. ^ "Blake Shelton on Twitter: "So unbelievable that I'm being inducted into the Oklahoma Hall of Fame tonight... Man they must be desperate!!! Ha!!! Truly is an honor."". Twitter.com. Retrieved March 14, 2017. ^ Betts, Stephen L. (June 3, 2015). "Hear Blake Shelton's Passionate Cover of Bob Dylan's 'Forever Young'". Rolling Stone. Retrieved April 5, 2017. ^ McDonnell, Brandy (September 11, 2015). "Blake Shelton to release greatest hits album 'Reloaded: 20 #1 Hits' Oct. 23". NewsOK. Retrieved September 14, 2015. ^ Stefano, Angela (March 8, 2016). "Blake Shelton Announces New Album, 'If I'm Honest'". The Boot. Retrieved March 8, 2016. ^ "iTunes Store (US) – Music – Blake Shelton – Savior's Shadow – Single". iTunes Store (US). April 8, 2016. Archived from the original on May 2, 2016. Retrieved April 21, 2016. ^ "BLAKE SHELTON STARTS 2017 AT NO. 1 WITH "A GUY WITH A GIRL" – Warner Music Nashville Official Blog". Warnermusicnashville.com. Archived from the original on January 18, 2017. Retrieved March 14, 2017. ^ Parton, Chris (June 7, 2016). "Blake Shelton on Hall of Fame Exhibit: 'It's the Craziest Thing'". Rolling Stone. Retrieved March 14, 2017. ^ News, A. B. C. (September 22, 2016). "30 Country Music Stars Join Forces for Historic CMA Music Video". ABC News. Retrieved November 3, 2017. ^ "Patsy Cline Museum, Madame Tussauds open in Nashville". Apmews.com. Retrieved November 3, 2017. ^ "How Madame Tussauds Nashville is one of a kind". Tennessean.com. Retrieved November 3, 2017. ^ "Blake Shelton Wax Figure Revealed on "TODAY" Show in Celebration of "The Voice" Premiere – Visit Nashville, TN – Music City". www.visitmusiccity.com. Retrieved November 3, 2017. ^ "Blake Shelton honoree for 2017 Oklahoma Creativity Ambassadors Gala". Theadanews.com. Retrieved November 3, 2017. ^ "2017 GALA". Stateofcreativity.com. Retrieved November 3, 2017. ^ "Sound Off: Is Blake Shelton's 'I'll Name the Dogs' a Hit? [Listen]". Taste of Country. Retrieved August 31, 2018. ^ "Blake Shelton Announces New Album 'Texoma Shore'". Billboard. September 21, 2017. Retrieved August 31, 2018. ^ "Hear Blake Shelton's New Single, 'I Lived It'". The Boot. Retrieved August 31, 2018. ^ Gaines, Jim. "Blake Shelton, Ryman to open Ole Red venue in Gatlinburg". Knox News. Retrieved July 8, 2018. ^ "Country Boy for the Whole Country". www.nytimes.com. Retrieved December 29, 2017. ^ "Blake Shelton Breaks into the Mainstream with 'Red River Blue'". Rollingstone.com. Retrieved December 29, 2017. ^ "GAC Spotlights Blake Shelton's Backstory". allaccess.com. Retrieved December 29, 2017. ^ "Blake Shelton". greatamericancountry.com. Retrieved December 29, 2017. ^ "Blake Shelton: Man Behind the Voice". Reelz.com. Retrieved December 29, 2017. ^ "Celebrity Page TV presents Blake Shelton: The Man Behind the Voice". Facebook.com/ReelzChannel. Retrieved December 29, 2017. ^ "Sheryl Crow Inspired by Blake Shelton". People.com. Retrieved December 29, 2017. ^ "Blake Shelton Inducted into Oklahoma Hall of Fame". theboot.com. Retrieved December 29, 2017. ^ "Blake Shelton Is the Newest Member of the Grand Ole Opry". theboot.com. Retrieved December 29, 2017. ^ "Past Winners". Country Music Association Awards. Retrieved June 27, 2017. ^ "Academy of Country Music :: Winners". Web.archive.org. April 4, 2012. Archived from the original on April 4, 2012. Retrieved November 3, 2017. ^ "CMT Reveals 2015 Artists of the Year Honorees". Retrieved June 27, 2017. ^ "American Country Awards on FOX – Dec 10th 8 pm ET/PT". theacas.com. Retrieved November 3, 2017. ^ a b "People's Choice Awards 2017: Full List of Winners". Peopleschoice.com. January 19, 2017. Retrieved November 3, 2017. ^ "Winners Database – American Music Awards". Theamas.com. Retrieved November 3, 2017. ^ "Winners Database – Billboard Music Awards". Billboardmusicawards.com. Retrieved November 3, 2017. ^ News, A. B. C. (May 2, 2014). "Complete List of iHeartRadio Music Award Winners". ABC News. Retrieved November 3, 2017. ^ "Blake Shelton Is the Newest Member of the Grand Ole Opry". theboot.com. Retrieved October 25, 2010. ^ "Blake Shelton Inducted into Oklahoma Hall of Fame". theboot.com. Retrieved November 14, 2014. ^ "Jason Aldean, Blake Shelton, Lady A among ACM Honors recipients – Tom Travis". News.iHeartRadio.com. Retrieved November 3, 2017. ^ "NATPE 2017 Announces Breakthrough Awards Finalists". January 17, 2017. ^ "A Look Back at the 2017 NATPE Reality Breakthrough Awards". Natpe.com. May 25, 2017. Retrieved November 3, 2017. ^ "Blake Shelton". Grammy.com. May 14, 2017. Retrieved November 3, 2017. ^ "Grammy Awards 2017: See the Full Winners List". Billboard.com. Retrieved November 3, 2017. ^ "Blake Shelton Celebrates 10 Million Albums Sold". Musicrow.com. October 11, 2016. Retrieved November 3, 2017. ^ "Billboard's 2017 Country Power Players List Revealed: Music City's Most Influential". Billboard.com. Retrieved November 3, 2017. ^ "Is "Austin" Blake Shelton's "Achy Breaky Heart?" Singer's Debut Single Ties No. 1 Mark Set By Billy Ray Cyrus". Cmt.com. Retrieved November 3, 2017. ^ "Flashback: Blake Shelton Starts Road to Fame in 'Austin'". Rolling Stone. Retrieved November 3, 2017. ^ BMI, BMI (June 27, 2017). "There's Nothing Like the First Time". ^ "Blake Shelton Has A Record-Breaking Week". All Access. April 13, 2011. Retrieved April 14, 2011. ^ Trust, Gary (April 13, 2011). "Katy Perry Takes Third Week Atop Hot 100 with Airplay Boost". Billboard. Retrieved April 14, 2011. ^ "Blake Shelton Celebrates Gold Album, No. 1 Song at ASCAP". Musicrow.com. August 31, 2016. Retrieved November 3, 2017. ^ "Blake Shelton Charts Six Songs From Just-Released Album". All Access. ^ "Greatest of All Time Top Country Artists : Page 1". Billboard.com. Retrieved November 3, 2017. ^ "Greatest of All Time Top Country Albums : Page 1". Billboard.com. Retrieved November 3, 2017. ^ "Greatest of All Time Top Country Songs : Page 1". Billboard.com. Retrieved November 3, 2017. ^ "Blake Shelton Biography". People. Retrieved November 3, 2013. ^ Blake Shelton Talks About Divorce, Leaving Nashville And New Girl Miranda Lambert – Starpulse Entertainment News Blog[better source needed] Archived December 23, 2007, at the Wayback Machine. Starpulse.com (May 1, 2007). Retrieved June 20, 2011. ^ a b c Bartolomeo, Joey (May 15, 2011). "Miranda Lambet and Blake Shelton Marry!". People. Retrieved May 15, 2011. ^ Entertainment News, Celebrity Interviews and Pop Culture – ABC News. ABC News. Retrieved February 10, 2012. ^ Blake Shelton's father dies –. USA Today. (January 18, 2012). Retrieved February 10, 2012. ^ "ACM Awards 2013: Full Winners List". Billboard. Retrieved November 16, 2016. ^ Michael, Rothman (January 7, 2016). "Blake Shelton and Gwen Stefani Gush About Each Other on Social Media". ABC News. Retrieved January 14, 2016. ^ "Blake Shelton". Forbes. 2015. Retrieved April 28, 2016. ^ HLN (June 6, 2017). "HLN's Robin Meade learns that Blake Shelton is her cousin". YouTube. Retrieved November 3, 2017. ^ "Blake Shelton's 'Cheers It's Christmas" Due October 2 | The Voice". mjsbigblog. August 6, 2012. Retrieved August 12, 2012. ^ Schillaci, Sophie (September 21, 2017). "Blake Shelton Announces New Album: Get the Details on 'Texoma Shore'". ET.com. Retrieved September 22, 2017. ^ "Hitman: David Foster & Friends | Introduction | Great Performances". Pbs.org. December 6, 2008. Retrieved March 14, 2017. ^ Simon, Alissa (October 21, 2014). "Film Review: 'Glen Campbell … I'll Be Me'". Variety.com. Retrieved November 3, 2017. ^ "| Grand Ole Opry". Opry.com. Retrieved March 14, 2017. ^ Galuppo, Mia (September 20, 2018). "Blake Shelton Joins Kelly Clarkson in 'UglyDolls' Movie". Hollywood Reporter. Retrieved October 10, 2018. ^ "Foxworthy's Big Night Out". TVGuide.com. Retrieved November 3, 2017. ^ "GAC Collection – TV Show, Episode Guide & Schedule – TWC Central". TWC Central. Retrieved November 3, 2017. ^ "Larry the Cable Guy's Star-Studded Christmas Extravaganza". Tvguide.com. Retrieved November 3, 2017. ^ "Blake Shelton". GAC. Retrieved November 3, 2017. ^ "GAC Spotlights Blake Shelton's Backstory". Allaccess.com. Retrieved November 3, 2017. ^ "Blake Shelton's Updated Backstory to Air on GAC". Musicrow.com. November 20, 2012. Retrieved November 3, 2017. ^ "Blake Shelton Comes on Down to The Price Is Right on April 16". Cmt.com. Retrieved November 3, 2017. ^ "GAC To Broadcast Blake Shelton's First-Ever TV Concert Special". Allaccess.com. Retrieved November 3, 2017. ^ "Blake Shelton concert special airing on GAC tonight". Newsok.com. April 4, 2011. Retrieved November 3, 2017. ^ "Invitation Only: Blake Shelton Released on DVD". CMT. December 18, 2012. Retrieved March 14, 2017. ^ "Blake Shelton Special To Air on GAC Saturday". Allaccess.com. Retrieved November 3, 2017. ^ "Blake Shelton, 'Malibu Country': 'Voice' Coach to Make Guest Appearance on Reba's Show". The Boot. February 5, 2013. Retrieved March 28, 2013. 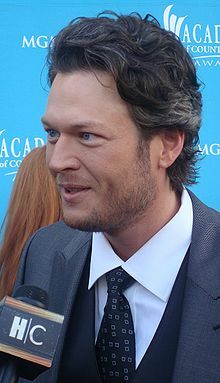 ^ "Blake Shelton, Kellie Pickler and Kix Brooks Land Guest Roles on 'Bounty Hunters'". Taste of Country. Retrieved November 3, 2017. ^ "First Look: Oprah's Next Chapter on the Set of The Voice". Oprah.com. Retrieved November 3, 2017. ^ "WWE Tribute to the Troops". Tvguide.com. Retrieved November 3, 2017. ^ Red Nose Day. "Red Nose Day Cast and Characters". TVGuide.com. Retrieved April 5, 2017. ^ "Michael Bublé's Christmas in Hollywood". Tvguide.com. Retrieved November 3, 2017. ^ "Hot 20 Countdown". Tvguide.com. Retrieved November 3, 2017. ^ "Blake Shelton: Man Behind the Voice". TVGuide.com. Retrieved November 3, 2017. ^ "NBC Confirms Gwen Stefani Christmas Special For December 12". headlineplanet.com. Retrieved November 15, 2017. Wikimedia Commons has media related to Blake Shelton.